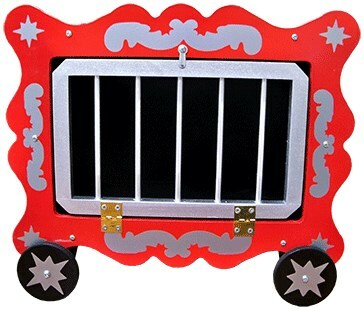 The Magician shows a beautiful Circus Wagon to be totally empty. Next, he takes out a white balloon and draws a rabbit on it with a black marker. He then lowers the front bars on the wagon and places the newly drawn balloon "Rabbit" inside. As the Magician locks the balloon "rabbit" inside the Wagon, he brings up the Birthday boy or girl and asks him or her to cast a spell on the balloon. In a flash, the balloon VISUALLY changes into a REAL Bunny! The bunny is taken out of the cage. The cage can then be examined! Dimensions Approximately: 14" x 16" x 12"